Stars: Dwayne Johnson, Neve Campbell, Pablo Schreiber, Roland Moller, Noah Taylor, Chin Han, Byron Mann, Hannah Quinlivan, McKenna Roberts, Noah Cottrell. Skyscraper is essentially a cross between Die Hard, the best action film of the 80s, and The Towering Inferno, the best of the 70s cycle of disaster films with an all-star cast and great special effects for its period. 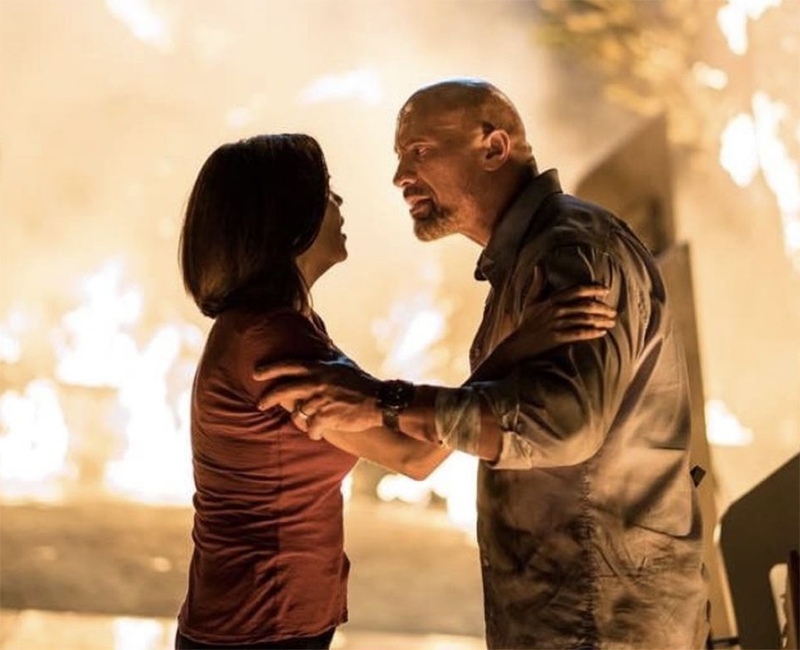 This is a big dumb action film, and no-one is better at making big dumb action blockbusters than the charismatic Dwayne Johnson, who is arguably the biggest movie star on the planet now. Johnson knows what his audience wants, and he usually delivers, the recent misguided big screen remake of popular tv series Baywatch notwithstanding. The Pearl is the tallest building on Earth, towering some 220 stories above the Hong Kong sky line, and featuring some high tech, state of the art security and safety systems. It is also, as its reclusive billionaire owner Zhao Long Ji (Chin Han) proudly states, “Three times the size of the Empire State Building.” The skyscraper features indoor gardens, retails spaces, apartments, and a state of the art sphere atop the building. Brought in to assess the tower’s safety systems for insurance purposes is Will Sawyer (Johnson), a former FBI agent and special forces operative who lost a leg in a hostage situation gone wrong ten years earlier. A private security consultant, he has been employed as the Pearl’s new security officer, mainly because he is cheaper than his competitors. He knows the building’s systems even better than the architect. But on the eve of the building’s grand opening, a group of armed terrorists sabotage the security system and set fire to the 95th floor. The owner has something of vital importance hidden in his safe in his penthouse, which Botha (played by Roland Moller, whom we saw in the superb Danish drama Land Of Mine, as the brutal sergeant forcing German teens to defuse bombs on Denmark’s beaches immediately after the end of WWII), the leader of the terrorists, desperately wants to get his hands on. Will’s wife Sarah (Neve Campbell, from Scream, etc), a former naval surgeon, and his twin children Georgia and Henry (McKenna Roberts, in her film debut, and newcomer Noah Cottrell) are trapped in the building. Will desperately tries to get into the burning building anyway he can, which leads to some exciting set pieces. Not only does he have to try and rescue his family, but he has to fight off flames, falling debris, the armed terrorists, and even the local police force who suspect he is complicit in the attack on the tower. Sawyer’s brawn and his artificial leg will come in handy in many a tight spot. Writer/director Rawson Marshall Thurber directed Johnson in the action comedy Central Intelligence, and he puts him through his paces here in a physically punishing role. Having come from a background in comedy (Dodgeball, We’re The Millers, etc) he proves a dab hand at directing some kinetic action sequences. The film moves rapidly from one well-staged action sequence to the next giving neither Johnson nor the audience much time to catch their breaths. This is a role that is tailor made for Johnson’s imposing physique and appealing, larger than life screen persona. But he does bring a hint of vulnerability to the character due to his tragic backstory and disability. In her first film role after nearly a decade spent on television, Campbell is not the usual hapless female in distress typical of most action movies. She proves quite resilient and self-reliant as she gets involved in some of the physical action while trying to save her children. The supporting cast also includes Pablo Schreiber (from Gang Of Thieves, etc) as Sawyer’s friend Ben; Byron Mann as a police inspector; Hannah Quinlivan as a mysterious hitwoman; and our own Noah Taylor, hamming up in a villainous role. But their characters are stereotypes rather than fully fleshed three dimensional characters. Moller’s chief villain here lacks the sinister quality and menace of Alan Rickman’s memorable villain from Die Hard, and doesn’t provide much of challenge to Johnson. The film has been shot by Oscar winning cinematographer Robert Elswit, best known for his collaborations with Paul Thomas Anderson. He gives us plenty of effective vertiginous shots as Johnson hangs from windows 100 stories above the ground, scales the outside of a building and even dangles precariously from the scaffolding of a massive crane. And those scenes in which Johnson climbs the outside of the building will have audiences recall Tom Cruise’s daring antics in scaling the Burj Khalifa in Mission Impossible – Ghost Protocol. However, the CGI effects that create the massive firestorm here are a little underwhelming, and the over reliance on green screen effects for some of the more outlandish stunts robs the drama of much of its tension. Skyscraper is purely a disposable piece of popcorn entertainment and something of a guilty pleasure for those prepared to suspend disbelief. Yes, it is formulaic, generic and fairly predictable, but it is never boring! Leave your brain at the cinema door and go along for the ride.